Kimberly prefers to be called Kim and likes to stay busy. She is interested in attending church and singing in the choir. 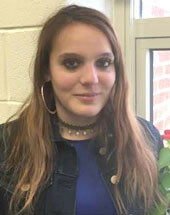 She enjoys drawing, reading romance novels by Sarah Evans, shopping at the mall, going out to eat, watching horror movies, going to the beach and going to amusement parks such as Kings Dominion. Kim is a budding chef some of her specialties are Shepherd’s pie, peanut butter cookies and macaroni and cheese casserole, which also happens to be her favorite food. Her favorite school subject is Math. Kim has volunteered at an animal shelter and aspires to become a veterinarian. She likes horses, dogs, cats and rabbits. Kim is also interested in cosmetology. She has been experimenting with different hair styles that include braids, curls, and using a flat iron. David is energetic and loves to both play and watch basketball and football. He also likes reading books, especially the Warrior Book Series. He enjoys adult coloring books, playing the drums, bike riding, going for walks, running for exercise, and dining out. David has an open mind and would like to travel, and listens to all different types of music. He likes to bake brownies and hopes to expand his cooking repertoire. At school David most enjoys studying Math and History. He intends to pursue higher education after high school, though he hasn’t yet settled on what course of study most appeals to him. Cassandra prefers to be called Cassie. She attends church regularly and also likes to participate in family activities. She enjoys listening to music, socializing with others, drawing, shopping, going out to eat, playing basketball, crocheting, running, going to the zoo, and bowling. Cassie participates on her school track team, and maintains the grades required to do so. Art is her favorite school subject. Her future aspirations are to become an artist or a tattoo stylist. She makes friends easily and has been invited to events with friends, such as birthday parties and bonfires. Cassie is also interested in learning to prepare meals.